Wharton School, University of Pennsylvania, USA and PropEquity team up for a knowledge partnership that focuses on Indian real estate research. PropEquity is honored to collaborate with SBI Bank to help their customers to choose their dream home across the country. Right from home search to loans, SBI Realty is powered by PropEquity in terms of data support, project information, among others. Honored to be appointed as the Exclusive Advisor to The Indian National Army in the area of Real Estate. PropEquity has been awarded for being among "The World's Greatest Brands & Leaders 2015-Asia & GCC 2015"
Data is fluid and ever-changing, so PropEquity continuously collects & analyses it to assimilate up-to-date information so that you can make timely and informed decisions. The data has been complied by P.E. Analytics based upon information available to the public and sources, believed to be reliable. Though utmost care has been taken to ensure its accuracy, no representation or warranty, express or implied is made that it is accurate or complete. P.E. Analytics has reviewed the data and, in so far as it includes current or historical information, it is believed to be reliable, although its accuracy and completeness cannot be guaranteed. Information in certain instances consists of compilations and/or estimates representing. P.E.Analytics’s.opinion based on statistical procedures P.E.Analytics deems appropriate. Sources of information are not always under P.E.Analytics’s control. P.E.Analytics accepts no liability and will not be liable for any loss of damage arising directly or indirectly (including special, incidental, consequential, punitive or exemplary from use of this data, howsoever arising, and including any loss, damage or expense arising from, but not limited to any defect,error, imperfection, fault, mistake or inaccuracy with this document, its content. 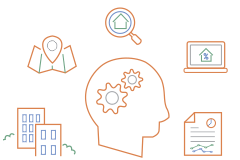 We convert raw real estate data into a visual and interactive intelligence experience that enables informed decision making in an otherwise fragmented and opaque market. Founded in February, 2007 and among the first Real Estate Research, Data and Analytics companies in India, PropEquity combines advanced analytics expertise and decades of Consulting experience to add immeasurable value to organizations. PropEquity is the only advanced online search platform for real time data and analytics for the Indian Real Estate Industry and generates insightful analysis for all verticals under residential, commercial and retail sectors from a macro to a micro level. We use more than 10 years of historical catalogued data which is ever growing to generate trends that can be mapped from history to present day. A 24x7 portal that provides exhaustive and granular details of India’s real estate sector. By leveraging our proprietary database of information on more than 65,000 projects across 42 cities covering 16,000 developers, our clients can gain access to real time information that would otherwise take months to assemble, along with the tools to search, analyze, compare, chart, and audit at a click of a button. 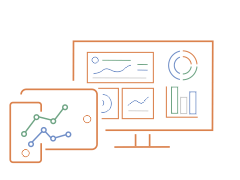 Our Business Intelligence and Data Analytics solutions helps organizations make informed tactical and strategic decisions by leveraging the power of analytics through scientific decision making practices. We have a team of Research Specialists who will work with you to precisely identify your research needs and ensure its prompt delivery to you. We serve our clients through ground up and granular research, spotting trends before they become obvious and ensuring best practices while achieving this. We offer our clients objective advice on emerging growth area analysis across Tier 1, Tier 2 and Tier 3 cities and real estate projects ranging in scope from small, single-use properties to large-scale, mixed-use developments to diversified multi-asset portfolios. We provide a comprehensive range of research products and services to Real Estate Private Equity Funds, Lenders, Developers, REITs, the Retail Industry, Banks & Financial institutions and other allied industries like faucet, Paints, elevator, etc. estate, who need real time primary research and data pertaining to the Real Estate industry. We’ve all heard the mantra: location, location, location. But most successful real estate companies understand that the true value of a location can only be assessed through granular research and trend analysis that can project the worth of a location way before it actually accrues in reality. Propequity enables this analysis and empowers its client with predictive decision making that no other tool can achieve. 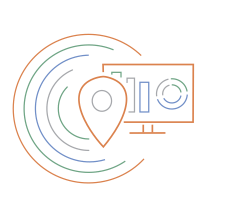 PropEquity and Google Maps have unveiled this geospatial tool that mingles maps and real estate data to help clients identify new patterns and business opportunities based on detailed analytics such as supply, absorption and price trends of cities and even neighborhoods. This is a pioneering and path-breaking product for the Indian mortgages lending sector. The CRM product empowers institutions with the ability to assess risk while lending to developers and individual home owners and provides a host of integrated yet specific solutions to the lending institution. 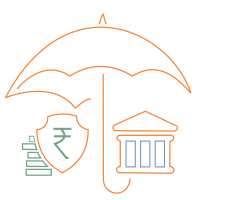 PropEquity’s Collateral Risk Management tool is used by India's leading banks, financial institutions and mortgage insurers to access the most comprehensive property price information to reduce costs, streamline processes and make informed lending decisions. The fully-automated Collateral Risk Management system centralizes and streamlines complex work flows as well as the associated products, analytics and data. As a result, PE CRM delivers significant cost reductions, efficiency and productivity gains, with increases in overall review quality and accountability. 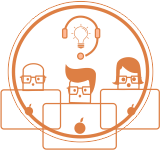 We have a team of Research Specialists who will work with you to identify your daily research requirements and ensure its prompt delivery, reducing your risk and suggesting best possible options in your decision making process. We put and restore order in complex datasets, cleaning, refining and structuring then in order to extract all relevant information. Regular tracking of more than 65000 project's Features, Construction Status, Price and Absorption movement, etc. Prop Equity has been awarded for being among "The World's Greatest Brands & Leaders 2015-Asia & GCC 2015" and Samir Jasuja, Founder and MD, Propequity has received the award of "The World's Greatest Leaders -Asia & GCC 2015". The top 100 brands and Leaders were felicitated at a grand ceremony on 12 December 2015 at the Indo - UAE summit 2015. The awards were held at the INDO-UAE Business Summit 2015 in association with IBPC- India Business & Professionals Council UAE under the auspices of Dubai Chambers of Commerce, UAE on 12th Dec 2015 at the Jumeirah Emirates Tower Hotel. This was an initiative of United Research Services International and AsiaOne Magazine research project with PwC- PricewaterhouseCoopers as the Process Reviewer. Brands and leaders from India, Singapore, Bangladesh, Malaysia, China, Thailand, Philippines, Sri Lanka, United Arab Emirates, Sultanate of Qatar, Kingdom of Saudi Arabia, Bahrain and Oman had participated in The World's Greatest Brands & Leaders 2015 at the Indo-UAE summit in Dubai. The Realty Kings Excellence Awards 2014 were held in Gurgaon in June 2014 to award the efforts of leaders in the Indian Realty Sector who dared to dream for a better world and who have contributed positively towards the urban development of India and more specifically Northern India. 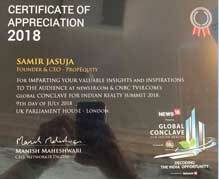 Realty Kings Excellence Awards 2014 felicitated, Samir Jasuja, Founder and MD, Propequity for his outstanding achievement and valuable contribution in Real Estate Research in India. 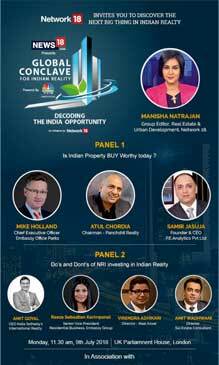 Together on the show, CNBC and PropEquity will address the dilemma of home buyer in the current complicated real estate environment through unpretentious analytics and succinct advice. Keep up with PropEquity product announcements, market reports, events, and news. For all the latest PropEquity real estate news, special offers, new market reports & product updates. March 4, New Delhi: Indian Army has signed an agreement with PropEquity, India’s leading real estate data, research and analytics firm to assist in acquiring houses for its officials. In a historic move the Army Welfare Housing Organization (AWHO) has awarded PropEquity with the mandate to facilitate the acquisition of homes for army personnel from private developers. The process will entail project identification, price negotiations, due diligence and ensuring buyer friendly terms and conditions. AWHO has come up with a business model called the ‘Private Industry Collaborative Business Model’ which will facilitate acquiring houses from reputed private builders at discounted prices for Army personnel & Veer Naris. “We are honored to be selected by the Indian Army to assist them in identyfing best housing projects across India. The major challenges in home buying is that many projects are being delayed by several years, construction quality is not of global standards, agreements are skewed in favour of developers and prices are unreasionably high. However, with out expertise in data, analytics and research and tracking of over 86,615 projects of 23,477 developers across over 42 cities, we will ensure best deals for our armed force. We salute the selfless contributions of Indian Army and extend our full support in advising them for home acqusitions,” Mr. Samir Jasuja, founder and CEO at PropEquity said. The MoU on this momentous occasion was signed by Lt Gen Rakesh Sharma, UYSM, AVSM, VSM, Chairman (ex-officio), AWHO and Mr. Samir Jasuja, MD Propequity on 3 March, 2017. Indian Army is one of the top two employers in the country and this landmark agreement will drastically ease the tedious process of identifying and buying best housing properties for its employees. A pilot project is being undertaken in Delhi/ NCR and based on its success, similar ventures will be executed in other locations. P.E. Analytics owns and operates PropEquity which is an online subscription based real estate data and analytics platform covering over 86,615 projects of 23,477 developers across over 42 cities in India. We add approximately 300 projects every month. It is a premier Business Intelligence product- a first of its kind in India in the Realty space.